This is the kind of thing that makes me crazy. 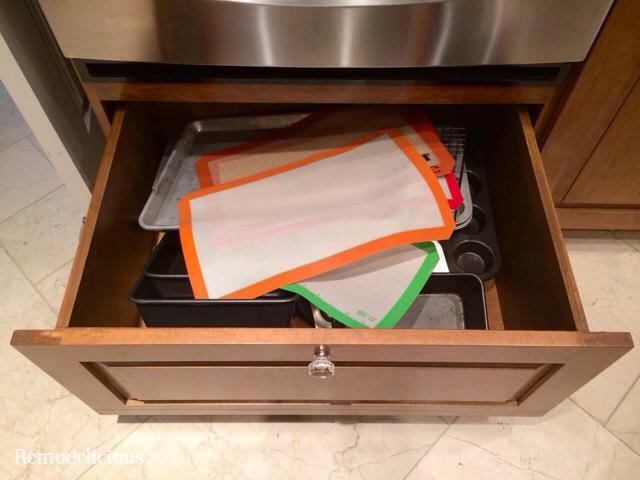 It’s super difficult to keep organized and tidy because you have to take most of the drawer out to do it. Who does that when kids are treating your kitchen like a NASCAR track and you’re trying to quickly get a load of dirty dishes in to make room for dinner preparations for complete mutany erupts? And then you need the dish on the bottom during nap time, right? Yet, the space above the oven just had a few rarely-used items in it. 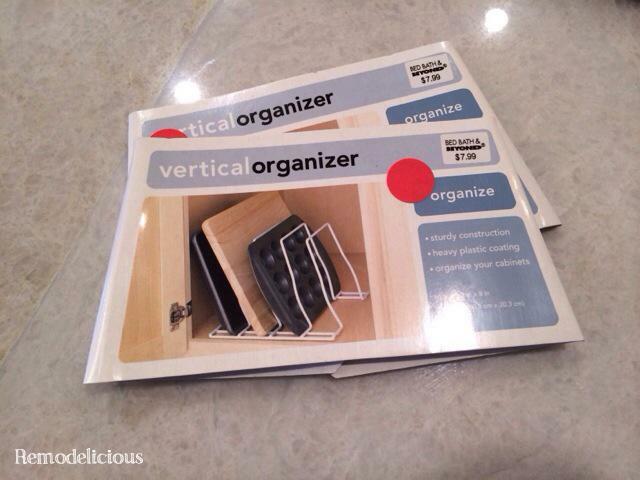 I’d been wanting to buy something like this when I happened upon a pair of these “vertical organizers” (like these or these) new in packaging at a garage sale. The flaw is that they will move when you put in a heavy dish. 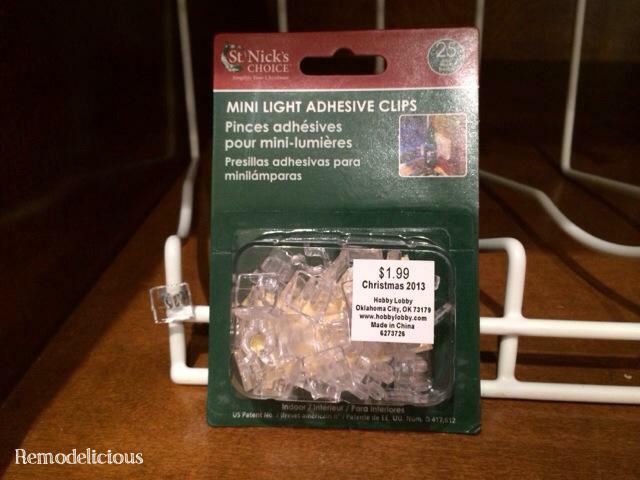 My solution was these adhesive clips intended for Christmas lights that I bought for another project and ended up not using for $1 a package (they were 50% off at Hobby Lobby). Command makes a better version that you can get online here. 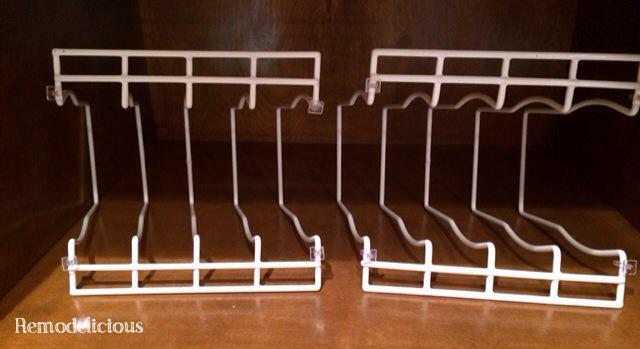 The wire on the racks clipped right in. I put 4 on each rack. Next step, add the adhesive & remove the backing. Then place in the cabinet. I tested with a smaller and larger cookie sheet & muffin tin to find the right distance. So much more organized and (more importantly) easier to keep that way! 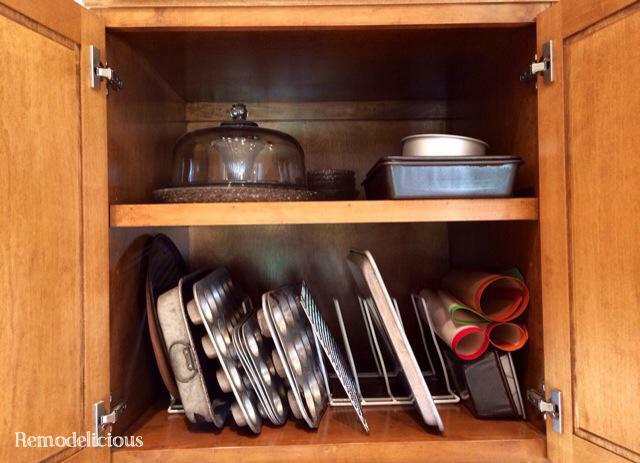 Even my husband can handle keeping this space organized.